The first piece of good news is that the EDZ, one of the new upgraded patrol-style zones, is gorgeous. This huge slice of Earth is genuinely spectacular. Lush forests await, beautiful statues left over from humanity’s time on earth loom over public event zones, and the dilapidated buildings of Trostland’s city still have tables and chairs in the halves of the rooms that haven’t crumbled away into dust. Your screenshot finger is going to get a serious case of RSI. But it’s not just a pretty face. The EDZ is packed with activities and things. The kind of things that make Guardians reject every other game on earth for the chance of sweet, sweet loot. 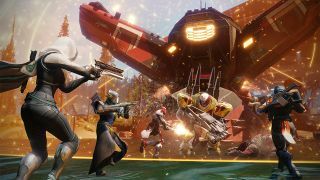 Here are seven ways you’re going to lose your time to Destiny 2’s European Dead Zone. No, I’m not just telling you to head out and shoot things for fun and call it an adventure (although you’re entirely free to do that if you want). The EDZ has literal adventures to go on with a capital A. Indicated by orange swords scattered across your Destination Map, Adventures are mini-quest storylines that break away from the main campaign. Making a perfect respite from traditional story or public events, Adventures are never just a case of go to X and shoot Y. Sure shooting is involved, we are playing Destiny after all, but one of my more memorable EDZ Adventures meant transmatting a slew of explosive traps to a Cabal landing site and laying in wait from a vantage point before taking in the fireworks as the shielded brutes triggered Destiny 2’s brand new explosive red barrels. Yep, things are far more fire and brimstone this time around. They did take our precious Tower after all. Fair’s fair. There’s a finite supply of Adventures but plenty of these bite-sized mini stories are scattered across the EDZ and each one is a perfect little slice of action with some great writing and excellent chat in your ear as you keep your trigger finger amused. It feels like these will be a perfect way to add story to Destiny 2 over the coming years without too much disruption as Bungie drops in more Adventure markers across the map. Speaking of ‘excellent chat’, there’s someone you really need to meet. We’ve got so used to the same Destiny characters that a fresh face is always going to be shiny and new - sorry Cayde, I still love you - but Devrim Kay, the ruggedly handsome overseer of the EDZ, is instantly your new grizzled best pal. If he’s the new norm when it comes to characters, Kay’s the perfect example of Bungie really taking some time to concentrate on who we’ll be spending a lot of quality time with on top of your usual Vanguard crew. This gentleman sniper is permanently parked peering from the window of Trostland’s church and you’ll be heading there often for drops of new gear. You can level up with Devrim by collecting EDZ tokens from around the world, each one increasing your standing with him for rewards. EDZ tokens can be found in loot chests everywhere as well as public events and general doo-goodery against the Fallen and co. He even hands out Legendary Engrams once you’ve reached a certain level. And you’re going to get used to his dulcet tones fast as he’s one of the main voices in your ear on many of your Adventures. If that wasn’t enough, I’ve heard he makes a mean cup of tea. Public events are back, but in even more good Destiny 2 news there’s no more guessing exactly where and when you’ll find one. The destination map shows you exactly where the Cabal can be found mining or the location of the nefarious Fallen attempting a Glimmer extraction. Helpfully, there’s even a countdown to make sure everyone can get together at the same time. This makes even more sense when you find out that this time around, public events come in two flavours, regular and Heroic. As you’d expect, Heroic public events hand over even more tasty loot when a tantalising chest appears in the middle once every last foe has been slaughtered. One thing though, it’s a little unclear exactly how you’ll trigger the Heroic events, but taking down specific ships appears to make a difference and up the ante and the rewards. While the odd Walker turns up with the usual weaknesses, the variation on offer is impressive. Hulking Cabal ships descend from on high, packed with tricky yellow health-barred villains, and one particularly impressive Extraction mission sees you under a Cabal Shield that’ll literally toast you every so often if you stay inside. It means that while the EDZ is expansive, it never loses any momentum or variation as you turn a corner only to find all hell breaking loose and Guardians fighting for their lives against slews of Fallen armed with cattle prods on sticks. Yaaay, no more quests just to get to the area of the map you want to go to. The Destination map simply means you can see the full EDZ and a number of Landing Zones for fast travel across the world. Want a public event but don’t fancy hoofing it over to the deliciously names The Sludge or The Gulch? Just check your map and zap yourself to the nearest landing zone. Helpfully there’s one near Devrim too so you easily turn in your EDZ bits before heading back out. Adventures show up on the EDZ map too and you can see exactly what you’ll earn from each one and what level you have to be. This is also where you can check countdowns on public events too, to make sure you’re going where the action is. Sure, it’s a map but this makes a small but vital tweak, and it’s another evolution that makes Destiny 2 feel slicker than ever. Destiny 2’s intriguing little dungeonesque quests - say that three times - can be found by spotting graffiti symbols across the EDZ. Head inside and you’ll end up on an ultra mini Strike, taking down Fallen or Cabal before tackling an uber boss at the end to unlock more loot. Adding the pleasant element of hide and seek before you play kill ‘em all, it provides yet another layer of popped Fallen noggins to the expanse of the EDZ. Like in the best open-world games, this area provides a vast array of distractions - far more than in the previous Destiny. I found myself in a public event mid-Adventure before spotting some symbols on a nearby wall. Oh, maybe I’ll do that then… It’s yet another welcome addition to the EDZ’s roster and makes this a frankly dangerous playground of opportunity even if all you want to do is dance in the middle of the carnage before giving everyone a slow clap. Ok, this might sound like a cop-out but I can’t say enough about just how good the EDZ looks. If you’re the kind of Guardian that likes to pose themselves for Twitter and Facebook, you’re going to find plenty of perfect Kodak moments. This is an environment without the sci-fi lines and neat order of somewhere like the Tower. Kays’s church, the streets of cities long abandoned, the EDZ is a return to nature and the contrast is stark. Throw in the upgraded visuals and a sweeping soundtrack and Destiny has never felt this alive. Ironic really given how many things want you actively dead. If this is only the beginning, this is going to be a one-game-year for you, Guardian.